Facebook Notes, before and after. Facebook had previously hinted at some changes for its oft-ignored Notes tool, and now those changes are rolling out across the site and mobile apps. Essentially, your Notes now look like Medium-esque blog posts. 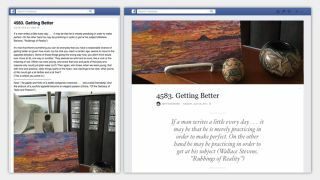 "Notes are now an even better way to write a longer post and share with anyone - whether it's a small group of friends or everyone on Facebook," writes Facebook User Interface Engineer Isaac Salier-Hellendag. Users get more stylish font formatting options as well as the opportunity to add a large cover photo at the top of the post. Photos, headers and lists can all be included too. The feature is rolling out to everyone on the network right now and you can check if your account has received the upgrade yet by logging in and heading to www.facebook.com/notes. For those of you with long memories, it's something of a retro turn for social media: at the start of the 2000s, blogs were the original profiles, made popular by networks such as LiveJournal and Blogger. If you're stuck for inspiration, Facebook suggests recapping your summer holiday, voicing your opinion on something in the news or sharing a recipe with your friends.